I stayed in bed ‘till 09:00. Cleaned up and went downstairs for breakfast. H, Abbie and Suzanne were there. Did our sound check, went back to the hotel to relax. Mal and myself ate together. As the dressing room facilities were limited we changed in our rooms and were driven straight to the stage. GREAT show to about 2,000 people, straight off stage, into the car and back to the hotel. I was in bed by 01:30am. I was up 06:15am, before my alarm call came through. Cleaned up and packed to fly to Tromso and drive to Finnsness. Checked in our hotel and I went to check my drums out before having tea with Mal & John. We all got ready in our rooms again, we were driven straight to the stage. Another great gig to about 2,000 people. We were driven straight back to our hotel. I was in bed by 00:30. I was awake at 06:45am. Cleaned up and went for breakfast. Went into town to get more DVD’s. I packed ready to check out and wait for H to pick me up to drive to Skegness. Checked in our hotel. H and myself had tea together before I went to the gig to check my drums out. After sound check H and myself ate at our hotel. FANTASTIC gig, PACKED SOLID. H and myself drove back to our hotel. I was in bed by 23:45. I was up just before my alarm went off at 06:30. Packed and cleaned up before going for breakfast and checking out. We all drove to Hastings. The weather was torrential rain all day and it was an awful drive. The others went to their hotel, I relaxed at the gig. Great gig. The support band were The Rockitmen and their guitarist was an electrician who used to do work for me when I was living in Bexhill On Sea! Also at the gig was, Dave and Hazel Hanley. Dave used to service my cars for me while I was living there. His wife Hazel used to work in the Bahamas (not while we were there) in the government offices. I told her about our predicament in 1968, I said I would love to go back there but I thought I might get arrested ‘cause of the massive hotel bill left unpaid. Hazel wrote to the authorities on my behalf who told her that I’m more than welcome to go back there as it wasn’t a criminal offence, it was between the hotel and us. (The hotel manager, Dan Darrow, probably lost his job and is now holding a bridge up somewhere). Met some fans after the gig giving me nice presents and Dave and Barbara Kemp drove me back to the Radisson Hotel where I was staying that night. Cleaned up, packed and went for breakfast. H and myself did a, great interview for a Swedish magazine ‘Rock N. Roll’. The reporter had actually brought plasters for me to put on my fingers. He wanted to copy the photograph from the Slayed album cover! We boarded the ship, got all of our room keys and food passes for the journey. I had a fantastic suite on the 11th floor (would you believe this was a boat). We had a, fantastic gig to about 2,000 people (remember this is a boat). I was in my cabin at 01:45am. I stayed in bed ‘till 11:00 just as the boat was docking back in Stockholm. We set sail for Finland again. Another great gig to a packed house. We all ate together afterwards. I was in bed by 00:50. Stayed in bed ‘till 11:30am, packed my case and checked out. We all drove to Vantaa - checked in the hotel and went for a sound check. Had a great show with Smokie & Nazareth to about 5,000 people. After the show we drove straight to Helsinki airport to stay. Got to bed at 02:30. I got up when my alarm went off at 06:00am. Cleaned up and packed to check out. Flew to Rovaniemi. Tim and myself went straight to the gig to sort the equipment out. Came back to our hotel to clean up. Another great gig to about 3,000 people. Mal and myself came straight back to the hotel. I packed my case and was in bed by 22:30. I was awake at 05:30. Cleaned up and went for an early breakfast. I did a great phone interview for WFM Radio for about an hour. Made my way to the Robin in Bilston....... Had another fantastic night to a full house and lots of friends turned up to the show including My brother Derek and his wife Chris, My nephew Ian and his wife Mel and Dave Hill's sister, Carol. Brother Derek and his wife Chris drove me to my hotel in Wolverhampton. I was in bed by 00:30. Woke up at 10.30am had planned to meet some others who were staying in the hotel for breakfast - but this ended up being lunch! At 14.30 I caught my train from Wolverhampton to Preston. I stayed in bed ‘till 11:30. Cleaned up and went downstairs for tea. Went to the,gig to do the sound check. Came back to the hotel to relax before going back to the venue. H, Jan (his wife) and myself walked back to our hotel. Had some tea before going to bed at 11:45pm. Have a wonderful Christmas and New Year...... see you all in 2016. I have started my analysis regarding my skin problem. At the moment I am covered in little suction pads - hopefully to sort out my allergy. I look like an octopus. There are suction pads all over my back and arms. ​I am back to the hospital tomorrow for more tests 'watch this space'. I was at the skin hospital at 09:00am this morning. The way things are going, I’ll be able to supply Blackpool Illuminations. I was at the hospital at 09:30am for more skin treatment. NOW I’ve got about a 3” square of, sunburnt skin there, they will do tests on it tomorrow. I was at the hospital at 09:00am. I was told I’ve an allergy to c ertain kinds of plants (only evergreens) and certain perfumes. They did more drawings over my body as to where ‘pads’ were to be stuck on me at some point. 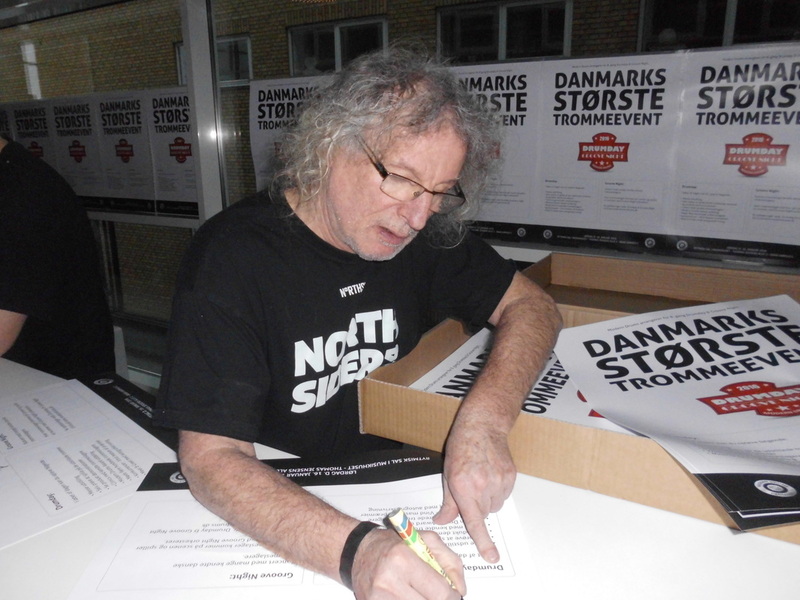 Met Soren from the music shop in Aarhus - who was running the event. I then met all the drummers taking part. Sadly, I couldn’t because of my skin complaint (not allowed to sweat or get too hot....). About a hundred kits were set up for the event. We all had a great day though, and I was called up on stage to do an interview to everyone..
We all had drinks together at the hotel after the event. So now no sunbathing ever again for me......... I have to totally cover up when I go in the sun. SoI’ve got me a divers suit for such occasions! Would you believe, I could finally have a shave, shower and wash my hair today. It’s been a week since the hospital allowed me to do that, because of all the, blood and skin tests and drugs I’ve battered my system with. NO More sunbathing for me. I’ve got an allergy to the sun's UV rays. Over the last few days I’ve been given a intensive sun ray treatment on a 3” square of my right leg. Sure enough it started to blister after a few days. THEN, the doctor got a ‘drill’ like they use to drill oil, only smaller. Ha! He drilled about a quarter of an inch into my leg where they gave me the sunburn for a sample of skin and ‘gunge’..... that was analysed ...... AND there you have it.... So now it’s stay covered up and wear a hat. ( I’ll get one of ‘H’s). I got up 06:00. Finished packing, met my step-son Andreas and we flew to Manchester and got a train to Liverpool. Checked into our hotel. Met with Terry McCusker and Brian (who were drummer and singer with a band Chas signed in the 1970’s called Bunny - they toured the UK and Europe with Slade). Also, met Lou Rosenthall who was drummer with Export. (Another band that supported Slade on a UK tour)........ Also, our very own Mal McNulty also joined us for the evening. Went to the famous Jackaranda Club in Liverpool and Andreas played and sung onstage. (Andrew Birkin used the name of this club in the 'Slade In Flame' movie). I was in bed by 00:00. Cleaned up and went for, breakfast, Andreas joined me. We went shopping for more DVD’s and CD’s, had lunch before making our way to LIPA. We were sitting having a drink when Ged McKenna joined us (he was the guy interviewing me). I was very impressed with Ged’s research. Had a great couple of hours doing the question and answer interview. I actually met Noddy Holders son (Django) who’s a student there. 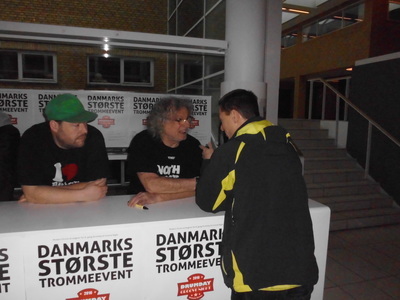 He had a talk to Andreas, who would also like to attend LIPA. Andreas and myself went out for dinner and had a relaxing evening. Don and Ged McKenna. Photo: Ged McKenna (twitter). I was up 07:30am. Cleaned up and packed, Andreas joined me for breakfast. We checked out of the hotel to get our train to Bristol. We tried to liaise with Kevin (Andy Scott's helper) during the journey to the Real World Studios. Found out he’d lost his phone! (Adam, one of Sweet's roadies informed us). BUT Kevin was there to meet us at Bristol station. We eventually got to ‘Real World’ too late and dark to show Andreas round the place...... we were in bed by 23:30. (The Real World Studios has live-in accommodation). We all went out to eat together. A very long day........ I was in bed at 21:30. Had another great day rehearsing. We decided to all eat together at the studio. The others went out to the pub. Andreas and myself stayed in our room watching TV. I was in bed by 21:30. (Don behind the miixing desk at Real World - working, while Andy and Suzi were doing overdubs - photo Kevin Smith). We all ate together at the studio before more recording. I was in bed by 22:00. I was awake at 07:30am. Cleaned up and packed (our last day) we all had breakfast together. Spent nearly all day doing overdubs and percussion before Andreas and myself caught the train to Bath. Andreas made his way to Heathrow for his flight. Checked in my hotel in Bognor Regis and was in bed by 21:30. I stayed in bed ‘till 08:00. Cleaned up, didn’t bother with breakfast. Made my way to town..... No DVD shops. I ended up catching the train to Worthing and went berserk in HMV. Relaxed back in my hotel and was in bed by 20:00. I was up 09:30. Made tea in my room and cleaned up. Went into Bognor for my breakfast (too late at the hotel). Drove back to our hotel with H. I was in bed by 23:30. I was up 06:30. Cleaned up and packed before breakfast. I was awake 07:00, took Rocky for his walk. Finished my packing to make my way to the Airport. I flew to Stockholm. Met uo with the others and Sweet, Smokie and Slade drove to Orebro to check in our hotel. Met our good friend, Promoter Thomas. We all checked in our hotel and eat together. I was in bedby 11:00pm. I stayed in bed until 09:00. Made tea in my room and cleaned up. 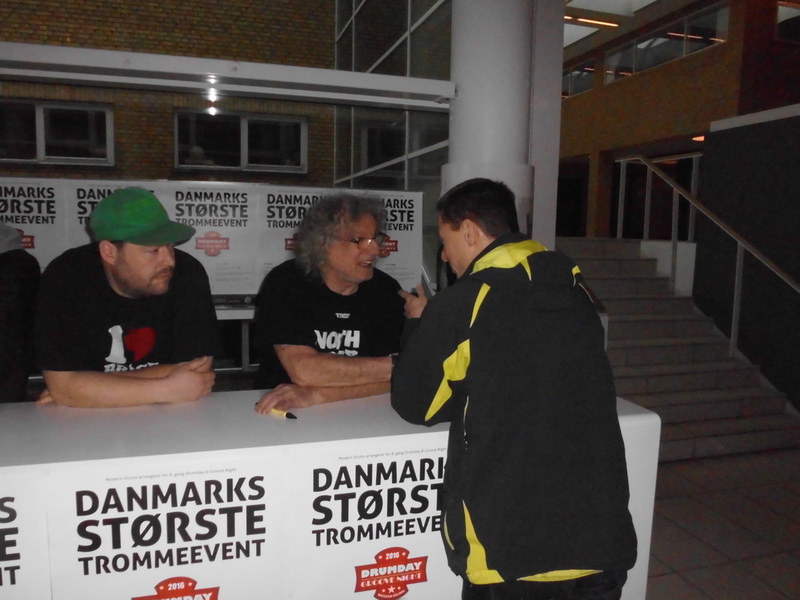 Met Tim, Robin and Toots (backline guy). We all drove to the gig. We had a great gig to about 3,000 people. We all eat at the gig before driving back to our hotel. I was awake by 06:45. Cleaned up and packed, checked out of the hotel and drove for about two and a half hours to Leksand. We played an Ice Hockey Stadium to about 3,000 people. Another great show, we all eat at the venue again before making our way back to our hotel. I was awake at 06:45. Travelled all day to Aalborg, Denmark. Checked in the hotel. Because of the hotel situation, we had to send out for food.... Lovely take-away of, salmon and vegetables. I was in bed by 20:00pm. I was awake 07:00. cleaned up and went for breakfast.... Everyone else came down one by one. I went to the gig early with backline guy ‘Toots’ (12:00 noon sound check). Sorted my drums out, the others arrived for us to do our sound check. Sweet and Slade were filmed by a Danish TV programme. I was in bed by 00:15. I stayed at the Radisson Hotel in London. I was in bed by 00:15. I had a panic earlier, I couldn’t find my mobile anywhere. I searched my room over and over and went down to reception in case I left it there when I checked in. No luck. I was awake 07:00am. I cleaned up and went for breakfast. I went into town shopping. Got the CD’s of, ZZ Top ‘The Very Badest’ and ‘Andy Fairweather Lowe and the Lowriders'.....‘Zone- O- Tone'. Caught the bus back to my hotel and relaxed with a ‘cream-tea’. I was in bed by 22:45pm. Came back to my room to clean up.... Made my way to Butlin’s, did the sound check. Had a, great gig to a ‘packed’ house. H and myself drove back to our hotel. I was in bed by 23:45pm. I was awake at 07:00am, cleaned up. H and myself had breakfast together. Checked out and caught the train to Stansted with dear friend Dougie and his wife. At one station on the way, a young lady went to go for her suitcase..... It had been taken by mistake by someone else who had got off the the train! Came back to relax in my hotel. I was in bed by 20:45. Made my way to Bath and checked in my hotel. Had a walk round the city before going to bed 22:15. I was awake at 06:30, cleaned up and went for breakfast. Made my way into Bath and found HMV.... Got almost everything on my shopping list. On my way back to my hotel a pigeon did his business all over my shoulder... Thinking it was good luck, I went and got a lottery ticket (later that evening I got the results - NOTHING.....). I was awake at 06:15. I cleaned up and went and sorted my Lottery tickets out before Kevin picked me up to have breakfast at Andy and Jane’s..... We drove to the concert site. It looked fantastic. One by one the artists turned up..... 10CC.. Suzi.. Big Country..Marmalade... Fish... Hamish Stuart from the Average White Band... Chris Thompson from Manfred Mann’s Earth Band... and the SAS band. 5,000 people were in the audience, fantastic they were too.... standing in the pouring rain all day. I got up and played drums with Suzi’s band and played ‘Mama We’re All Crazee Now’ with the SAS band...... Mark Brzezicki, drummer with Big Country, paid me a really flattering compliment, saying “You’re one of the best Rock drummers around”. Cleaned up and went for, breakfast before making my way to the restaurant in Barnes. I was first there. At the end, when almost everyone had left, Nod, Andy, Ed Bicknell and myself sat round a table for about another hour talking and laughing with ‘business’ stories.????? (The meal was on the day before Nod's 70th birthday). Relaxed before a fantastic gig to about 5,000 people in a big marquee in the grounds of a massive estate. Had a lovely relaxing day, met lots of old friends, chatted for hours with them all. We all eventually got to Amsterdam after many delayed flights. Checked in our hotel much much later than expected. Mal and myself had tea, I was in bed by midnight. I was awake at 07:30. Made tea, and started to clean up. Got my stage things together and went for breakfast. I sat talking to, Holly Johnson from Frankie Goes To Hollywood and his agent Nikki who happens to be married to Nick Van Eede - who Chas Chandler used to manage during the late ‘70’s. He was solo then, he toured Poland with Slade and also the UK. He always wanted to be part of a band.But Chas said NO. He left Chas, formed a band (Cutting Crew) and went to No. 1 in the States twice ( I think.). ‘WET, WET, WET. were top of the bill. (No-one saw them about in the backstage area at all). I went to the gig with Tim and Robin..... We had a, great afternoon gig to about 4,000 people. Came back to our hotel and Mal and myself ate together. I was in bed by 21:30. I was up by 08:00, cleaned up and went for breakfast. I then went to the festival site (25Km away) with Robin and Adam (Sweet's roadie, he was helping us out as Tim is on holiday). Spent time in the catering area chatting to Mark King (Level 42) they were also on the show. Also, Jimmy Somerville, (he’s smaller than H). Came back to our hotel straight away, relaxed there and watched part of the Germany V Portugal game ( I said part...I went to bed 22:00). Met Davey Johnston, Elton Johns guitarist in Heathrow Terminal 5. He came over to say hello, saying: “It’s been a long time since Sydney in 1974” (Elton John and all of his band came to our show at Ranwick Race Course to 60,000 people). Elton was ‘raving’ after the show saying: “ I can’t understand why you haven’t made it in America”. We had a great gig to about 1,000 people near Berlin. We then drove straight after the show to Frankfurt (Oder). Checked in our hotel, I was in bed by 00:30. I was awake by 07:00am. Cleaned up and went for breakfast. 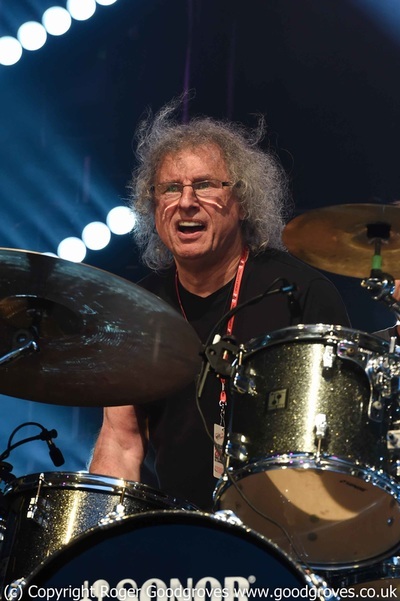 I went to the gig with Robin & Brendon (Smokie’s roadie on loan) to sort my drums out. We did our sound-check. Met the East 17 guys who were also on the show. They were great guys. We had a great show to about 5,000 people. Mal, H and myself came back to our hotel. I was in bed by 00:30. I went to the gig with Robin and Tim. Spent all day there. Sweet opened the show as they had to race off straight after. Smokie were also on the show. We had a great gig to about 5,000 people. I was up at 06:30. We all drove to Hasslo. Straight back to the hotel. I was in bed by 11:30. The gig was called “ Rock Of Ages” is an annual gig, we have played there before. About 5,000 people attended, we had a fantastic gig.............. Barclay James Harvest were also on the show. I didn’t see them as I was SO tired. I went straight back to the hotel and was in bed by 21:50. I got up when my alarm went off at 08:00. I went with, Robin and Tim to the gig to sort my drums out. Spent all day there, had tea with the Sweet and Smokie guys. ‘H’ and myself were taken back to the hotel more or less straight away. I was in bed by, 21:00. I was out of bed 10:00. Cleaned up and went for tea. Went to the gig with Robin and Tim. Sorted all the equipment out and waited for the others to arrive to do our sound check. Came back to the hotel to relax before the gig. Went back to the venue, had a great open air show to about 1'700 people…… No Rain. Drove back to the hotel and was in bed by 23:00. I was up 06:30. Cleaned up and packed to drive to Kuressaare. Checked in our hotel, I went to the gig with Robin and Tim. A beautiful setting with the stage right in front of a castle. There was a tree right in front of the stage, a few feet away from Mal! Did our sound check, went back to the hotel to relax. Went back to the gig already changed, we went straight on stage. A great show to about 3'000 people. H, John Berry and myself drove straight back to the hotel. I was in bed by 23:45. Went straight to the gig with Robin and Tim to sort my drums out. Did the, sound check, came back to our hotel. H and myself had a walk round the harbour before leaving for the gig. A great crowd of about 3,000 people, at an open air show,….. just as we came off stage, it started to pour with rain! Got back to our hotel, I was in bed by 12:00 midnight. I was awake at 08:30, made tea and cleaned up. Met everyone in the breakfast room. I went to the gig with, Robin and Tim. Friedhelm was also there - he used to drive us everywhere a few years ago when we played Germany…. Spent most of the afternoon at the gig. After our sound check, we relaxed back at the hotel. We all changed in our rooms, so we could go straight on stage for our show. A, great show to about 3'000 people….. Lots of flies on stage !!!!!!!!! I was awake just before my alarm clock went off at 07:00. Cleaned up and packed before breakfast. We all checked out and drove a few hours to Oldenburg. I went to the gig with Tim and Robin to sort my drums out. I arranged to meet Dethy and Anke, his wife, If I can explain: some time ago, I did some recordings with a German band and Dethy is the lead guitarist. Christian, their keyboard player' was also there. It was great to see them……We recorded ‘C’mon Feel The Noize.’Together. We also filmed the recording session. I was awake at 7 :00, Made tea and cleaned up…. I went back into Bognor to do the lottery and get a new touring jacket….. I then went to Chichester to get DVD’s…. Got the bus back to Bognor, when I got on the bus to pay….. The driver winked at me and did the Slade fist and didn’t charge me…Ha Ha. I made my way to Butlin’s sorted my drums out with Jon ‘Now Hire’…. The others arrived and we did our Sound check. Would you believe The Osmonds were also on earlier…. They consisted of Jimmy Osmond (not so little), Jay Osmond (great drummer) and Merrill Osmond..... They have great voices….. I watched some of their show before going to their dressing room to finish the pizza they had left!….. I think they had already eaten about 10…. We had a great show to a VERY packed house….. Fantastic crowd. I was awake at 07:00am. Suzi called me from Lithuania, where she was gigging, to say some paper in Australia had put it out that QSP was her band.... She put them right that it was an equal situation between ‘Quattro, Scott & Powell’. I made my way into town, it’s full of café’s and charity shops. Mind you, some years back, I got two Slade albums from Oxfam - “Old New Borrowed And Blue” and “ Nobody’s Fools” - I knocked them down from £2:00 to £1:50 cash….. for both. I made my way to Butlin’s to sort my drums out. It was only Mal, John and myself who did our sound check. H stayed in the hotel…. I went back to the hotel. H told me about Jim Lea having a write up in the Wolverhampton, Express & Star as to how great he was and a genius. H and myself were laughing like Herbert Lom (Inspector Drefuss in the Pink Panther films). We left for the gig. A fantastic gig to a sold out crowd. Adam, Sweet's roadie was there (they play tomorrow). H and myself made our way back to our hotel. I was in bed by 23:50. I had a call from an Australian reporter for an interview about “Quatro, Scott & Powell” touring there next year. We spoke for about 20 minutes. I was up at 07:00, cleaned up and caught the train to, Gt Yarmouth. Arranged with John Berry to give me a lift to Robin's on Saturday to sort my drums out. Checked in my hotel. Did a fantastic phone interview for about an hour for a, local newspaper…He was raving about our Web-Site where he found out a lot of information. Dave Kemp called me to say Suzi Quatro's Fan Club had been on to him about using some of our site material on Suzi’s. I went for tea in the hotel restaurant and unbelievably Graham Nash and David Crosby’s son (looks exactly like his Father) were there. I introduced myself and told Graham we played twice with the Hollies in the early ‘60’s (when he was still with them). I woke at 09:15, made tea and started to clean up. Went for breakfast. The I had a walk around town. Made my way to the gig to sort my drums out with Jon Overton. The others arrived and we did our sound check. H and myself made our way back to our hotel and we ate together…… John Berry called to say he and Robin would have breakfast in our hotel tomorrow with us. We had a great gig……. H and myself made our way back to our hotel. I was in bed by 01:15. I was awake at 07:30. Cleaned up and went for breakfast. Collected my £120:00 lottery winnings! !… Relaxed all day and played the QSP rehearsal tapes a lot… I was in bed by. 20:00. I was awake at 06:00. Cleaned up and packed, went for, breakfast. Andy Scott picked me up, we drove to Stag rehearsal studios near Suzi's place. We rehearsed all day, we all went out to eat together… Stayed the night at her place. I was awake at 07:00. Cleaned up and packed. Met everyone downstairs for breakfast. Drove to Stag rehearsal studios to spend the day rehearsing again. I packed Adam’s (Sweets roadie) drums away before Andy drove me to the Radisson Hotel at Stansted Airport. I eat in the Airport Terminal and was in bed by 20:20. I was awake at 05:00. Cleaned up, packed and went for breakfast. Checked out of the hotel and made my way to the Terminal. Checked in for my flight to Prague. Relaxed in the lounge. Nice flight to Prague…. Pavel Tesar, the promoter, met me and we drove for about 2 hours to Brno. Checked into our hotel, we ate there together. He left for his office, I drank MORE tea and was in bed by 21:45. Stayed in bed ‘till 10:00. Went for tea. Met H and Abbie (some of the others had been delayed for 4hrs at Heathrow). Went to the gig with Robin and Alex Harris (standing in for Tim). Sorted my drums out. We all did our sound check. Relaxed back in the hotel. We had a great gig to about 3,000 people here in Brno. Cleaned up and packed to check out and drive to Hradec Kralove. We had about a two-hour drive. Checked in our hotel and we all had lunch before I went to the gig with Robin and Alex. We did our sound check and relaxed back at the hotel. H and myself having tea together. Cleaned up and packed and went for breakfast before driving to Prague. Our rooms weren’t ready when we got there SO (heavy metal) we had free tea and cakes all round. orted my drums out and did our sound check. Relaxed in our hotel before a fantastic gig to 2,000 people. I was awake 06:00, cleaned up and did some shopping. I'd won £8:60 on the Thunderball (won’t be buying my Caribbean Island yet)... Dear friend Dave Kemp picked me up to drive to Bury St Edmunds. Finished setting my drums up and we did the sound check…. Mud 2 were also on the show. 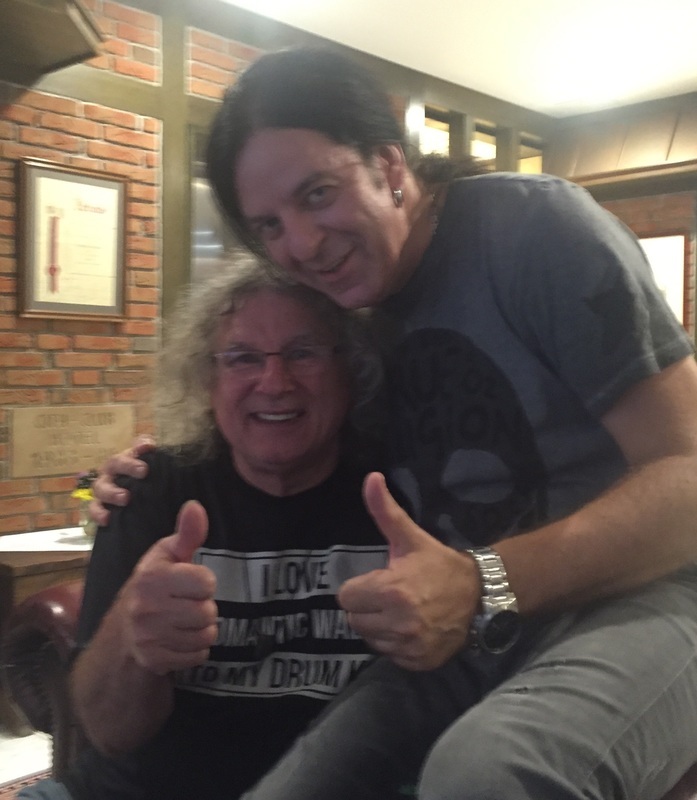 I know their drummer Phil really well, so I let him use my drums to save all the messing around…. We had a great show to about 1,000 people. Dave drove me back to the Radisson. I was in bed by, 12:00 midnight….. I was up 08:00. Cleaned up and went for breakfast. I went into town to do ‘toiletries’ shopping then I made my way to Butlins. We all did our sound check. H and myself made our way back to our hotel to relax before going back to the gig. We had a fantastic show to a sold out crowd. H and myself drove back to our hotel. I was in bed by 23:15. Cleaned up and made my way to meet everyone for a little soiree in Barnes, London. There was about forty people (musicians, actors, writers etc.) there. I was privileged to sit on a table with Bruce Welch from the Shadows and Clem Cattini celebrated session drummer (he has played drums on over 200 hit records, 55 No. 1’s, that is some record). Bruce and Clem were ‘winding’ each other up about success in America. Bruce toured there a few times with Cliff and The Shadows BUT never really had any success there either touring or with records. WHERE AS when Clem was with The Tornados their recording of the instrumental ‘Telstar’ was No 1 all over the world.. Relaxed in the hotel. Sweet and Suzi Quatro arrived from a gig they’d played together the night before. I went to the gig with Robin to sort my drums out. We ALL had a fantastic show to about 3,000 people. We opened the show…..We all ate together after the show. I was in bed by 22:45. I went into town to do my lottery. Went to the gig with Rob and Jon from Now Hire……Sorted all the equipment out. It was SO cold my hands were sticking to my cymbal stands. We did our sound check, went back to the, hotel for a “Meet & Greet”….. quite a few people. East 17 were also on, they’re great guys. People from the X-Factor ( I wouldn’t have a clue) and other singers. Basil Brush was also there, BUT he were being filmed at a different hotel in town. I was disappointed, I couldn’t have a photo taken with him….. Aargh. Came back to our hotel freezing. I was in bed by 21:30….. I was up at 07:00. Cleaned up and went for breakfast. I walked into town to sort my lottery out ( I won £3 pounds)…..I then walked about 2 miles along the seafront to the gig. Tim arrived, then Robin. Spent all afternoon sorting equipment out before we all did a sound check. Came back to our hotel with Abbie and John Berry to relax before going back to the gig. Great gig to a sold out crowd, about 4,000 people. Mal, H and myself came back to our hotel. I was in bed 23:00. (In the old days I would have just been going out). I was awake 08:00, made tea before cleaning up. Met Suzanne for, breakfast, spent some time in the beautiful town before going to the, gig…… Sorted my drums out before the others arrived to do our sound check. John Berry and myself walked back to the hotel, had a drink together, before leaving for the gig. I was awake at 06:30, Cleaned up before breakfast. Robbie from East 17 contacted me for our agent Abbie’s details so she could get them work…. Great sold out gig, I came back to the hotel with H's nephew Mathew. I was in bed by 23:15. I was up, at 07:30, cleaned up. We all had breakfast together before driving to Hayling Island. H and myself checked into our hotel, I cleaned up before going to sort my drums out. Another great show…. I was in bed by 23:15. I was awake at 07:30, cleaned up and went for breakfast. I then met Vicki, Carole and Chris Selby at ‘BlueBricks’ for a cuppa before Vicki took me to the cemetery to put flowers on Mom & Dads grave. Went back to the Robin to do our soundcheck, I then relaxed in my room there. Earlier on, I had ‘fish’n’chips from the place opposite the Robin ( it’s still there). Johnny Howells, Mick Marson and me used to go there back around 1962! As it we always went there SO late after gigs, they were always clearing up, getting ready to close. We could always get all the scraps for pennies! We had a great show to a fantastic sold out crowd. Lots of faces in the crowd I knew….. I was in bed by 12:00. I was up at 08:00. Cleaned up and packed and went for breakfast. Mal and myself drove to Salisbury in his car. Checked into our hotel and cleaned up. We then left for the, gig and soundcheck. Great gig to a sold out crowd…. I was in bed by, 23:00. I was up 07:30. Cleaned up, ready to drive to Wrexham. Mal and myself drove together again, checked into our hotel. I went to the, gig to check my drums out. We had a, great gig to a sold out 3,000 crowd. I gave some laundry to John Berry to do for me……. 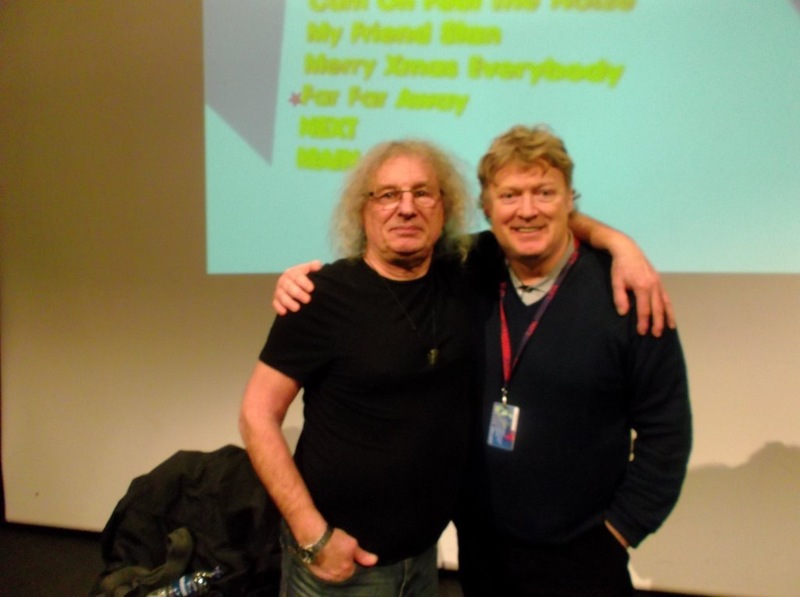 Terry McCusker, my old mate from the band Bunny, who supported Slade on numerous tours in the ‘70’s was there. (Chas Chandler signed them to Barn Records) He had a copy of a book about Ringo Starr for me. He has written the book with Alex Cain about Ringo Starr called ‘Ringo Starr and the Beatles Beat’. They very kindly asked me to write a ‘foreword’ which I was quite honoured to do. I caught the train to Cambridge. Checked in my hotel. 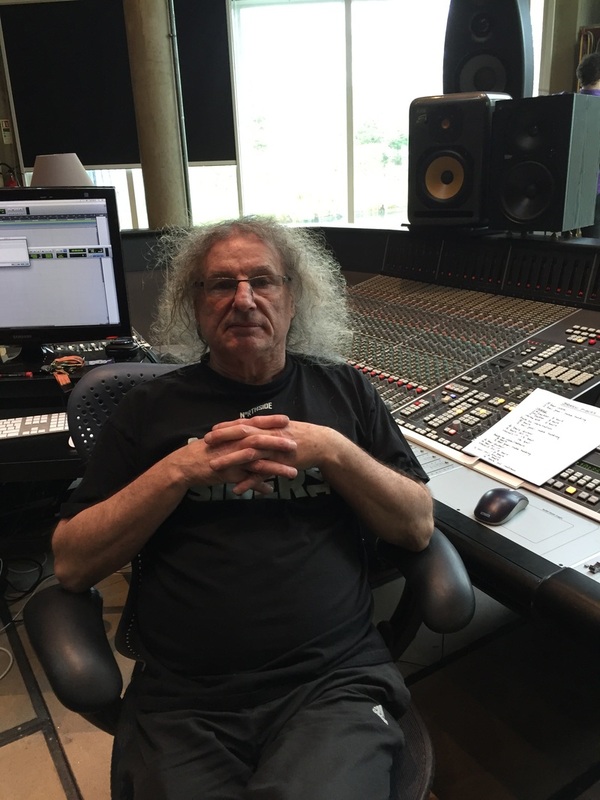 Contacted Willi Wright (my drum roadie from the ‘70’s & 80’s). He picked me up and we went out to eat together in a Cambridgeshire pub. We reminisced all night ‘bout our days together. In those days, Willi used to drive the ‘Happy Car’ which was Nod and myself. 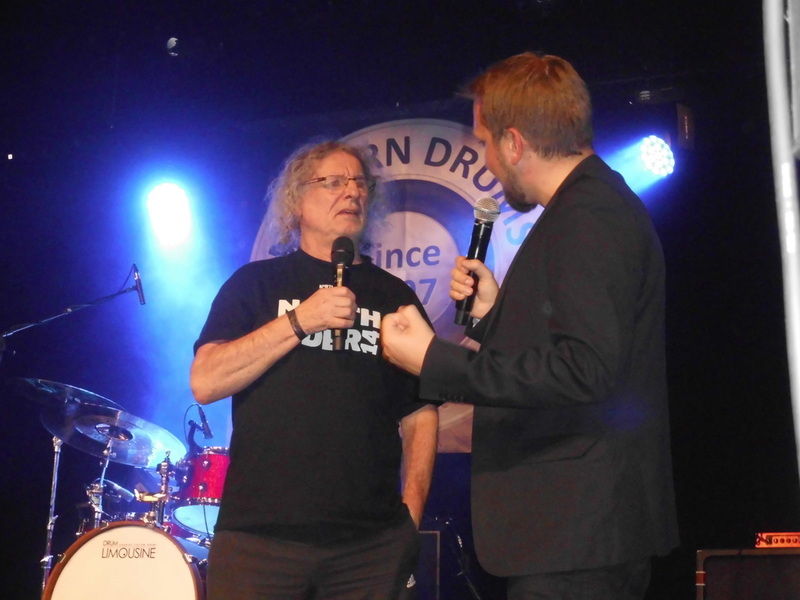 The car was so named cause Nod and myself always used to stop at every pub that was open during our travels…..
‘H’ and Jim Lea’s car was the ‘hospital’ car (which no-one wanted to drive…) - they just wanted to go straight home, stopping for nothing. A great night out. I was in bed by 22:15. I stayed in bed ‘till 10:00. Relaxed and made tea in my room before cleaning up. Went into town to try and get a book about John Bonham that his brother has written. No luck…. I went to the, gig to sort my drums out. I met John Shearer a drummer I was with at Ludwig Drum Co’s 75th anniversary in Chicago back in the ‘80’s. We were reminiscing ‘bout how we had to hold each other up at the photo ‘shoot’ and how we tried to walk out with the dinner suits Ludwig had made for everyone. Another fantastic sold out gig, The venue had a snow machine installed and when it was turned on during Merry Xmas Everybody it unfortunately fired snow straight into the face of a lady at the side of the stage in a wheelchair. She couldn't get away from it. John Berry through her his Christmas hat afterwards as some sort of compensation! I met a few fans in the lobby of my hotel and had tea and a chatr with them. I was in bed by 01:00. I was awake at 05:00. Cleaned up and packed before breakfast. Dave and Barbara Kemp picked me up to drive to Brighton together. (A bit of a nightmare journey, took an age to get out of Cambridge - all caused by a mile long queue of traffic trying to get into Waitrose). We did some photos in the Grand Hotel (where we filmed scenes for Flame). We also had afternoon tea (which just consisted of tea and scones) It cost £17 each for 2 scones and a pot of tea! I nearly put the tea pots in my suitcase! 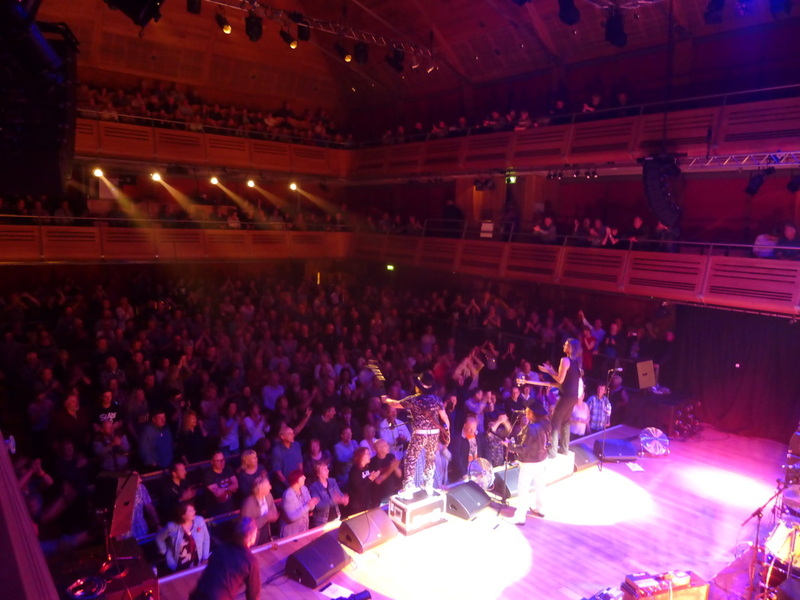 We had a fantastic last night in Brighton….. 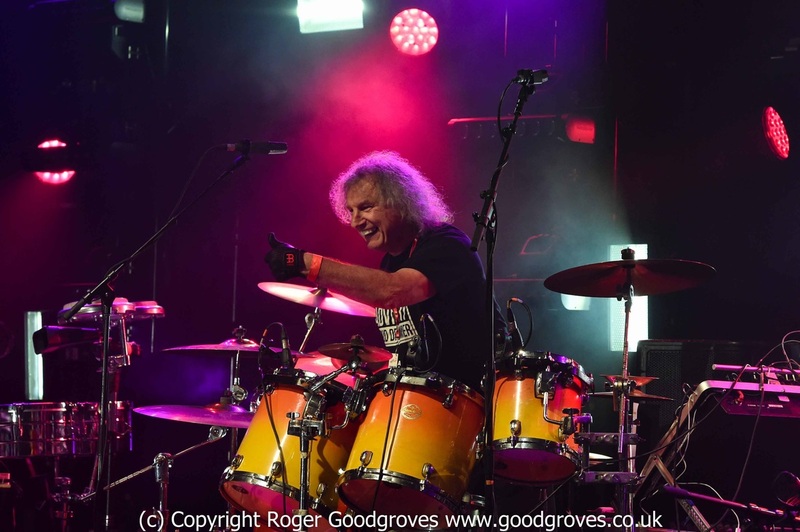 I CAN’T THANK YOU ALL ENOUGH FOR YOUR SUPPORT…..
Next diary pages will be from Australia next February when I tour there with Andy Scott and Suzi Quatro…..